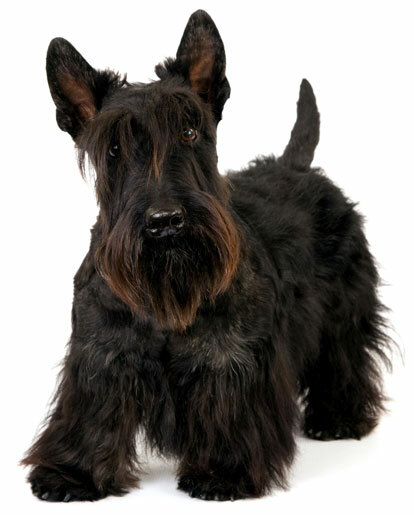 The Scottish Terrier, or "Scottie," is a fearless, independent, loyal, alert, and confident dog. He is gentle and loving with his family, but aloof and suspicious toward others. He will accept visitors into your home only conditionally, and tends to reserve all his playfulness and fun for you. He needs your love and companionship, but generally on his own terms! He is a lively and bold dog with a strong sense of himself. Obstinate and willful, he can be a challenge to train, and will sometimes obey you only reluctantly. He must have obedience training, however, so that he can learn his place in the house. He is sensitive to corrections and scolding and requires a gentle but firm approach to training. He is a proud dog who is also steady, faithful, and extremely protective of his family. He makes an ideal watchdog because he is constantly on the look-out, and has the deep, resounding bark of a much larger dog. On the arrival of a visitor, he will bark loudly and repeatedly to alert you. He can sometimes bark too much. He's fearless in the face of anything he sees as a threat, but with training will learn to size up a visitor and then calm down. He has a great deal of energy and needs plenty of exercise and mental stimulation. He loves long walks (although his legs are too short to go jogging with you), romps in a safely enclosed area, and playing ball games. You should not play games with him that encourage aggression (like tug-of-war). When outdoors, he must always be on a leash or in a safely fenced area, because he can chase and be aggressive toward other animals. He is aggressive toward other dogs, and will take on dogs much larger than he is. He is not the kind of dog you can leave alone in a yard. He loves to dig, and if he gets bored will make mincemeat of your lawn. He is better with older children and generally not recommended with younger children, although this may be possible with careful monitoring, and if he is raised with young ones as a puppy. He will usually run away if he is being teased, but he can also bite. He is a very low shedder, and so would be a good pet if you like your home neat and tidy. The Scottish Terrier is 10 to 11 inches tall (to shoulders) and weighs 18 to 22 pounds. He has a double coat consisting of a medium-length, wiry outer coat and a soft, thick undercoat. His coat color can be black, wheat, or brindle and may have red, silver, or white in it. Pet coat: His coat only needs to be brushed occasionally and clipped short every few months. Show coat: Brushed for 10 to 15 minutes twice a week to avoid mats and tangles, and stripped (dead hairs plucked out) every few months. The Scottish Terrier is one of the oldest Highland Terrier breeds, and beginning in the 19th century was bred to hunt and kill foxes, rabbits, badgers, rats and otters. He was first shown in England in 1860, and a joint English-Scottish club dedicated to his breed was formed 1882. He was introduced to America in 1883, and throughout much of the twentieth century was extremely popular, with two Presidents--FDR and Eisenhower--devoted "Scottie" owners. His AKC popularity was 45th out of 157 breeds in 2007.